This week on The Revolution with Jim and Trav presented by Outdoor Channel, Sportsman Channel and World Fishing Network, we'll serve up the need to know basics for bagging whitetails, mulies, elk, moose and dall sheep. That's right, it's the beginning of September and that means that big game seasons are opening up all around the country. For weeks, die-hard sportsmen and women have been scouting everything from their local woods or prairies, to far-flung mountain ranges and gnarly canyons for their favorite game animals. Yes, just as the dog days of summer are fading so is the sweet by-and-by where we have been hunting for months. Our big game fantasies are quickly becoming reality as the silhouette of deer targets begin to dot every hunter’s yard and we're using up our remaining sick days for gun range therapy classes. 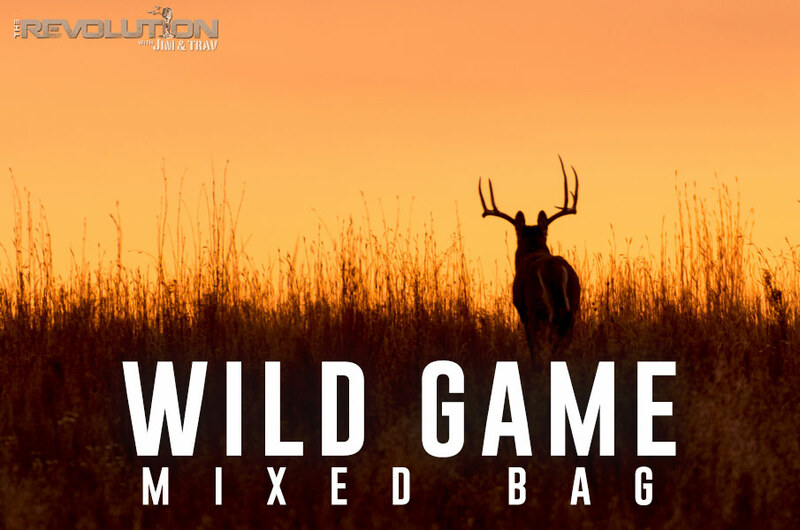 Joining us in our “Wild Game Mixed Bag” pursuit will be Kyle Lamb of Viking Chronicles Wednesdays at 8:30 p.m. ET on Outdoor Channel, plus Randy Newberg from Leupold's Fresh Tracks with Randy Newberg seen Sundays at 11:00 p.m. ET on Sportsman Channel and the Owner/Operator of KOVE in Lander, Wyoming, Joe Kenney. Sergeant Major Kyle E. Lamb (retired), spent more than 21 years with the United States Army, 15 of which were with the U.S. Army Special Operations. SGM Lamb has conducted combat operations in numerous theaters of operation, including Mogadishu, Somalia (Black Hawk Down), and has served numerous tours in Iraq and Bosnia. He is now bringing his skills and expertise to the screen as the host of Viking Chronicles Wednesdays at 8:30 p.m. ET on Outdoor Channel. Tune in to The Revolution for a two-part interview with Lamb where he begins by discussing an Alaskan sheep hunt. Lamb talks about the circumstances leading up to the moment he found himself taking a 728-yard shot on a ram and how even an experienced shooter, like himself, gets nervous when taking a shot. He then switches gears and dishes on the upcoming moose hunting trip he is preparing for. As a former military man, Lamb knows what he needs to survive and that makes packing simple. As long as he has food, water, ammo and some shelter, Lamb says he’s fine. Part of the experience is dealing with problems as they arise and in the event of poor weather conditions, like he has experienced before, you figure out how to deal with the discomfort. Lamb talks about the undisclosed destination they are headed for in Alaska as well as the firearm he’ll be taking along. He discusses wood versus carbon fiber stocks and also stresses the importance of keeping the pressure off of the barrel so you don’t throw off your shot and miss your opportunity at the game you pursue. Joe Kenney is the Owner/Operator of KOVE in Lander, Wyoming and he joins The Revolution to discuss the 73rd annual One Shot Antelope Hunt happening September 14th – 18th. The One Shot Antelope Hunt is a world class competitive hunt that pits eight three man teams against each other. The task of each team member is to harvest a pronghorn antelope with one-shot. The event, which started in 1940, is held each September at the base of the Wind River Mountains in Lander, Wyoming. Joe will discuss the rules of the tournament but also the legend of the hunt, where it all began, how it has evolved into the tournament it is today, and the notable guests that attend. Tune in for an inside look at this unique One Shot Antelope Hunt.